Virgo January 2017 Horoscope forecasts that it is time to focus on family and emotional matters for those born under the zodiac of Virgo. Career, though important, can be in the background for the time being. Try to work out future plans and make necessary changes in your existing method of planning based on your past experience. The actions of the Virgo personality in January 2017 should be based on consensus and views of other people. Your independence and determination to have your way is limited. You can accomplish your goals with the help of other people this month. The 2017 monthly predictions foretell that planetary momentum is powerful and about 90 per cent of the planets are forging ahead after the Mercury retrograde of January 2017. So the pace of your life will be staggering and you will have to be careful. The Virgo born is a highly pragmatic person. So you will be highly successful in the execution of logical projects. The astrology 2017 forecasts for the Virgo sun sign shows that career issues will not be important this month. You can expect normalcy in your professional life. Towards the end of January 2017, work and business will become more important. Virgins looking for jobs will be surprised by the ease and number of opportunities available for employment in the month of January 2017. 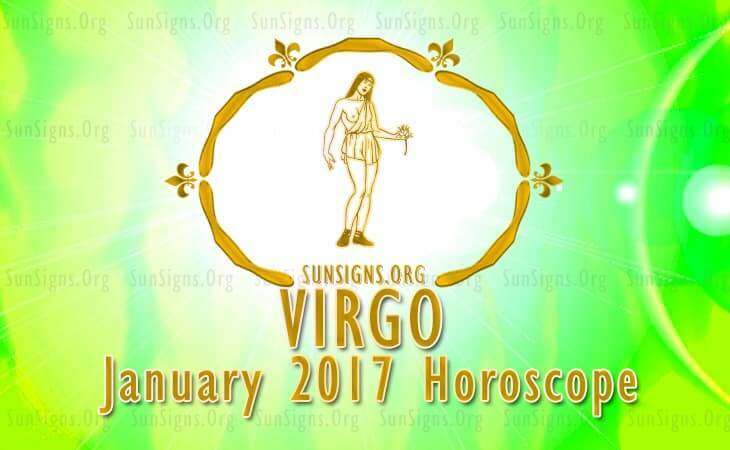 The Virgo January 2017 monthly predictions foretell that finances are highly promising this month. Professionals will make money through their careers. People dealing in stocks and shares will do well until the mid of January 2017. Businessmen will have an excellent time because of the efficiency of their workers. People engaged in Arts and Writing can expect sudden inflow of money. Single Virgo born people will find love at the office or in the healthcare industry in January 2017. Creative virgins and spiritually oriented people will engage the attention of singles. Online dating will be the new fad for the Virgo. Love for married Virgo couples will be unstable. Family matters will be quite turbulent. There may be conflicts between family members and pregnancy might be one of the issues. Your home may undergo some maintenance and renovation. In January 2017, health of the Virgo personality will be quite encouraging. This can be improved further by indulging in physical exercises. Here are a few tips for Virgo fitness. The Virgo January 2017 horoscope predicts a busy month for your career front but relationships will need some patience.